A fine establishment reputed to be Orlando's hottest nighttime show and dining experience. 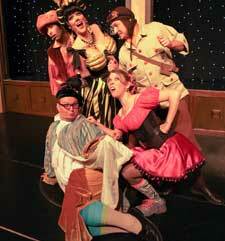 This pirate themed music-comedy production is hilarious and the dinner is exquisite. Expect a warm welcome along with a complementary rum punch drink. After a brief meet and greet with cast members, there is a quick oath/creed of the golden gong before the performance. The show stars the flamboyant, Gretta, who emcees the occasion with flair. 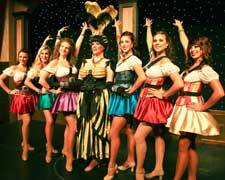 She is allied with a cast of performers with impressive talents and skills; a traveling band of entertainers from around the world. Each improviser is funnier than the other with puns, funny punchlines, and at times songs. The decor is a dazzling display of lavish items plundered and secured from far away voyages. One could say pirate-chic; gleaming, luxurious with ample space, and very cozy. Throughout the evening, the cast keeps the atmosphere lively and entertaining with amusing jokes and friendly tricks. The comics' improvise competition for a blue ball drink is a colorful act, where the audience participate by selecting the subjects for the joke. The audience decides the winner between the wits by applause. The cast engage the guest to join in on stage for a few clever skits and good clean fun. Each of the one-of-a-kind acts are fascinating eye-openers. The Ukrainian hula hoop spinner manages to keep the multiple bands suspended, rotating at a fast pace and in varied directions. This breathtaking act looks beautiful and seems impossible, yet she holds her own. Talented Poopsie is a magician, comic, mime and juggler. He captivates the room with his eccentric style and expressive actions. He performs a brilliant magic-mime act. The charming couple, Divorcsky from Mother Russian, is daring with their unbelievable acrobatic feats for two. The Mongolian contortionist performs a spectacular solo act. She really impresses the crowd with her spine tingling, daring moves, especially the inverted balance stands with and without her hands. The quick change artists accomplishes a stunning act of rapid speed dressing to beat the clock. Their performance is amazing the way they change in and out of beautiful, smartly designed outfits swiftly with flair and elegance. The speciality acts are so impressive. Guest enjoy a three-course meal, featuring classic choices. The courses are a fresh toss salad, perfectly prepared prime beef with all the trimming, and delightful opera cake for dessert. Indulge in a delicious dinner with a sophisticated talent show to top it off. Each dish is served and presented in a festive manner with a suitable introduction via song. The singing, dancing waitresses, in flattering wrench costumes, provide attentive service without missing a beat. This is a great facility for group functions, anniversaries and birthdays. Vegetarian and other meal choices are available as well.